Water is the most essential ingredient to a healthy life. Water has many important functions in the body including: Transportation of nutrients / elimination of waste products, Lubricating joints and tissues, Temperature regulation through sweating, Facilitating digestion. When exercising its always important to drink plenty of water and stay hydrated. Proper hydration is especially important during exercise. Adequate fluid intake for athletes is essential to comfort, performance and safety. 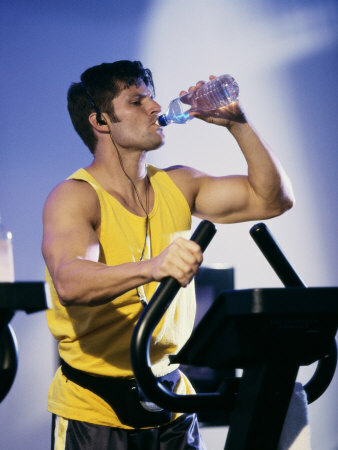 The longer and more intensely you exercise, the more important it is to drink the right kind of fluids. Athletes need to stay hydrated for optimal performance. Studies have found that a loss of two or more percent of one's body weight due to sweating is linked to a drop in blood volume. When this occurs, the heart works harder to move blood through the bloodstream. This can also cause muscle cramps, dizziness and fatigue and even heat illness including heat stroke and heat exhaustion. Getting dehydrated during your workout is never a good thing. Make sure you stay away from these causes of dehydration when exercising.